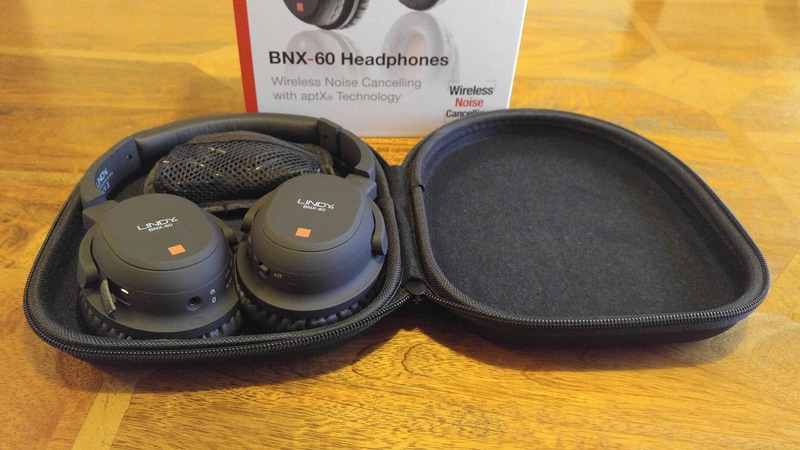 Welcome to my review of the brand new Lindy BNX-60 bluetooth wireless headphones with noise cancellation and APT-X. The Lindy BNX-60 are the latest wireless headphones from Lindy just announced at CES 2016. The Lindy BNX-60 headphones are very well designed with a lot of thought and attention to the extras included. First up you get a decent hard case. No more worries about breaking these in transit. Secondly, the hard case has a velcro detachable zipped pouch which houses the 3.5mm audio cable, micro USB lead for recharging and the airplane and 6.3mm adapters. I thought the velcro detachable pouch was a neat touch. As you can see from the photos the headphones have lots of controls on the ear cups. This means you can control your music and take phone calls. Phone calls were clear and the caller at the other end had no problem hearing me. On the right ear cup is the automatic noise cancellation on off switch and volume control. 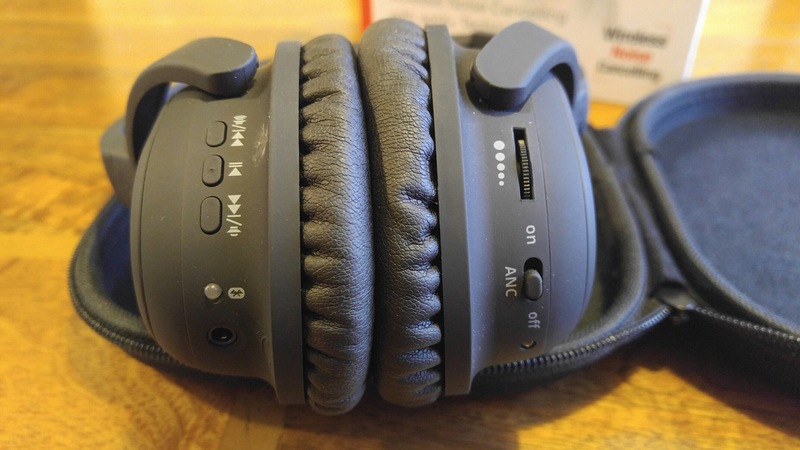 The automatic noise cancellation can be turned on independently of the bluetooth connection. With the noise cancellation switch on, the sound stage is pushed forward slightly and the treble becomes more pronounced. There is also a very very slight amount of hiss. Lindy state that 85% of low frequency noise is removed. In my testing the headphones did make a noticeable difference removing outside sounds with the noise cancellation switched on. Without the noise cancellation switched on the treble/mid is slightly pushed back in the sound stage. Bass is solid and punchy but not over the top. The BNX-60’s has APT-X which do make a difference if your device also is compatible with APT-X. I also connected the audio cable to my LG V10 smartphone and was surprised that the sound quality was reasonable. I listened to as many different genres as possible and enjoyed the sound produced by the Lindy BNX-60 headphones. Comfort. The Lindy BNX-60 headphones are light and comfortable to wear. A versatile solid offering from Lindy Headphones. Comfortable, bluetooth, noise cancellation, APT-X and a carry case makes this a recommendation from me. How would you rate these against the Plantronics and Sony’s you have used Gavin? I’m currently waiting for the Plantronics to come back into stock on Amazon (using your link of course). The Plantronics have better sound quality but do cost more though. They are also heavier than the Lindy. In terms of bass the Lindy are more neutral sounding. Thanks Gavin…. I’m fortunate not to worry about costs providing the improvements are on par with additional expense. I rather like the way the Plantronics auto turn Off when removing from your head and turn back On again when replaced. I’m hoping the bass isn’t too strong as that is one area my hearing doesn’t lack. It’s the treble where I am very short and this is often at the expense of clear voice hearing. Having said that I’m always interested to read your views on any other new ones (as in today) you get to test and use. With Amazon you never know what discounts appear from day to day. Was higher when I wrote article. Is the Plantronics really SO much better than this LINDY design in terms of range? I also wonder about the plantronics cup shape around the ear. Some users find the Plantronics CUPS a bit small. Are the LINDY BNX-60s more oval shape more comfortable? Otherwise this design would work well for me. Partly because they look more compact, in terms of pack size. I’m wondering, which BT headphones have you decided to stick with? This is the only review of the LINDY BNX-60 I can find so far and the make is new to me. In the past I would look at Sennheiser, AKG Bayer or SONY for headphones. How do these compare in terms of build QUALITY and clarity. Thanks for reviewing these BT 4.1 headphones. They look like a good value option. Hi Paul. I actually own both these and the Plantronics. The Plantronics are much older and are clunkier compared to the Lindy. It boils down to weight, size and travel. The Lindy are lighter , smaller overall package but equally comfy and fold into a hard case. The Plantronics are heavier but do sound a lot better. More bass. Better miss and treble. But a bigger overall size. And some find them heavy to wear. Ear cups on the Plantronics are fine. Don’t forget the Plantronics cost £250 when new. The Lindy are £90 new. Thanks for the specifics Gavin. The range on the Plantronics sounds great, but I mainly want cans for voice podcasts SKYPE and occasional travel; I need clarity and strong Base is pointless in these situations. Smething more neutral & compact with a robust case may be a more sensible option for me. How is this weather treating you? You’re location is pretty windswept under normal conditions. Last night was very blustery here in Fleet, Hampshire. One last thing. My Plantronics are quite old now and have been superb for the use I’ve got from them. I like the Lindy for the fact they have a hard case and take less room when travelling. Do these support Bluetooth multi pairing, ie can you listen to music via Bluetooth from one device and be paired with a phone as well that will interrupt the music to take a call?